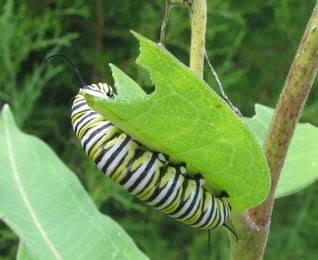 After we began getting Monarch caterpillars on our milkweed we were so excited. Especially the morning I walked down to the mailbox to find to find a new Monarch out of its chrysalis warming up its wings. I was hooked! The next year I began seeing bugs all over the milkweed plants and got very concerned about whether they would be eating the leaves that the Monarch caterpillars needed. 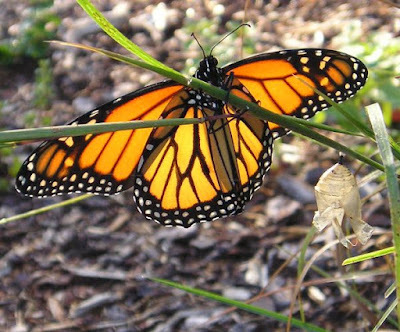 Monarchs only eat plants of the milkweed family, and we only had about 8 plants at the time so I was very protective of their food source. After searching my bug books I found out that the bugs were called Milkweed Bugs and that they had few predators because their bodies contain bad tasting compounds found in the sap of milkweed plants. 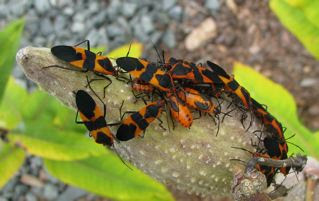 Milkweed Bugs use their bright colors to advertise their bad taste. Inexperienced birds that take a taste of their first milkweed bug are unlikely get another. These bugs gather in groups on the milkweed plant until they become adults. The nymphs (immature bugs) look like adults except that they aren't as big and don't have full wings. Their color pattern is different also. They appear bright red, rather than the mix of red and black. They pass through five (5) molts until they become adults. After the eggs are laid, it takes a week for them to hatch and then another month for them to become adults if the temperatures are warm. Adults are about 5/8 inch long. The tip of the abdomen is black, followed by a solid orange segment (with tiny black dots at the edges). If the next two segments following the orange band have solid black bands, the bug is a male. However, if the segment following the orange band is orange in the middle, making it look like it has two large black spots on the sides, followed by a segment with a solid black band, the bug is female. Our milkweed plants produce flowers in the summer and then produce a large seed pod (about 1.5 inches wide by 4 inches long). The Milkweed Bugs pierce the seed pod to feed on the seeds. They do no other damage and do not bother the caterpillars which feed on the leaves. However, if you want your milkweed plants to spread by seed, they can be considered a problem. Our plants are spreading by root which they do a better job of than by seed since you generally don't even get great results by putting milkweed seeds in the ground. It's best to plant them in small pots and transplant after they're on their way. © 2008 Donna L. Watkins - This article was reprinted with permission from TheNatureInUs.com.